Is a Strong France and a Weak Germany the EU’s New Normal? German Chancellor Angela Merkel and French President Emmanuel Macron take a break on the balcony of Merkel’s office after a meeting, Berlin, Germany, April 19, 2018 (AP photo by Michael Sohn). 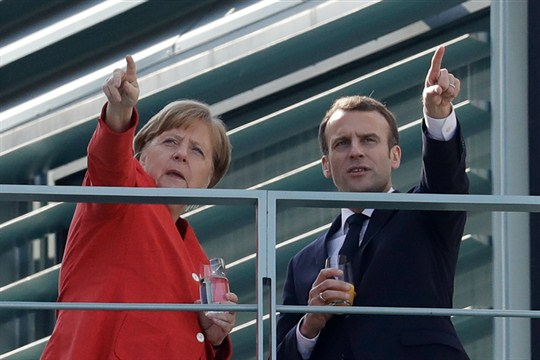 With French President Emmanuel Macron and German Chancellor Angela Merkel staging back-to-back visits to Washington this week, many observers have commented on the stark contrast in the two European leaders’ respective relationship with Donald Trump. But the visits also highlight an emerging intra-European dynamic: A strong France and a weak Germany at the heart of the European Union.